Historically, businesses have always followed consumer communication trends. In fact, businesses have started to use the customer as the cue. Today’s marketplace is concerned with disruption, user experience, and anticipating problems for consumers. This means that businesses must come to customers on their preferred channel, platform, and schedule. 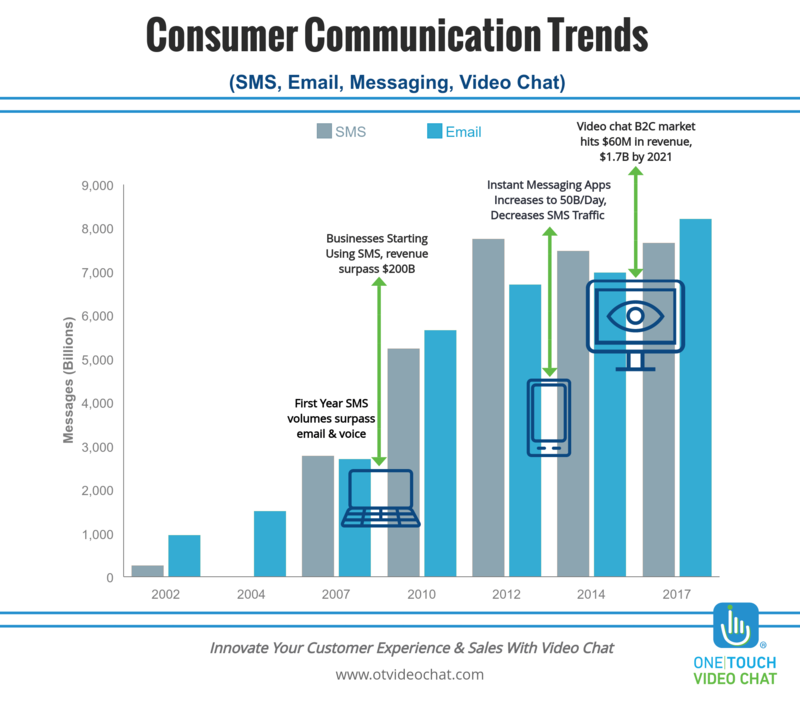 Let’s look back at how consumer communication trends first started with using channels like email, text messaging, social and now video chat. One Touch Video Chat has developed an infographic to show these trends over the last 15 years. I remember getting my first AOL email address back in the early 90’s. The email accounts back then you could only send emails to other people with AOL accounts. This was the same for other early providers like Hotmail. Over the years to come, person to person email increased significantly and cross provider email became standard. Today, over 800 billion emails are sent each year. The largest percentage of that is used for business, while the consumer to consumer email was declined dramatically since new channels like SMS and instant messaging apps came into play. In 2007, texting (consumer to consumer) became the most widely used mobile service. It started off where consumers paid per text message sent but by early 2010 most all carriers had moved to “all you can eat text messaging”. Next, businesses followed the consumer communication trends and started using text messaging to communicate with their customers’. Short codes and message gateways became a real business between 2010-2012. Just like any new technology many corporations were hesitant at first to use B2C text messaging platforms as they didn’t think consumers wanted to get text messages from companies. However, the most innovative brands got on board early, creating sweepstakes or coupon campaigns delivering big ROI’s. In 2017, companies are still using text messaging, it’s commonplace for many industries like banking, doctor’s appointments, and even your Bed Bath and Beyond coupons. However, in 2014, we saw the first decrease in text messaging (messaging platforms on the revenue side, consumer on the send side) due to the introduction of instant messaging apps like SnapChat, WhatsApp and others. In 2014, over 50 billion messages are sent per day using instant messaging apps. The younger demographics reduced their text messaging volumes greatly. Their ability to instant message with apps vs. texting without mom and dad seeing. Apple and Google introduced their respective Facetime and Google Hangout in late 2011. However, it didn’t really start taking off until mid 2014. The ability to be able to video chat with your friends and family is still operating system specific. However, consumer to consumer applications like Skype, SnapChat and WhatsApp allow you to be able to video chat with your friends across operating systems. This really enabled the consumer Voice over internet protocol (VOIP) consumer to consumer market. The VOIP market has been used in businesses for many years prior but this was the first time it came to market in scale for consumer to consumer. So, why should businesses be thinking about how to use video chat technology with their customers? It’s the same trend of how businesses followed trends of emailing, texting, and advertising through social. In the US, business communication trends have always followed the consumer communication trends. Consumers’ using video chat through carrier features and/or third party apps have been on a hockey stick growth. The video communication platform-as-a-service forecast by IDC forecasts the market will go from $44 million in 2015 to $1.7 billion in 2020, a 107% CAGR growth. According to NPD, Millennials using their smartphone for video calling has increased 56% from Q2 2015 to Q2 of 2016. Furthermore, Walker predicts with Customer Experience and demands by 2020, video conferencing for business will go from 9% in 2015 to 44% by 2020. They predict that customer experience will outweigh product and price for buying decisions. We know mobile is king and mobile video chat should be front of mind. By 2020, according to Marketo mobile devices will be the #1 biggest impact on marketing technology. To see more on video chat for your industry and research.